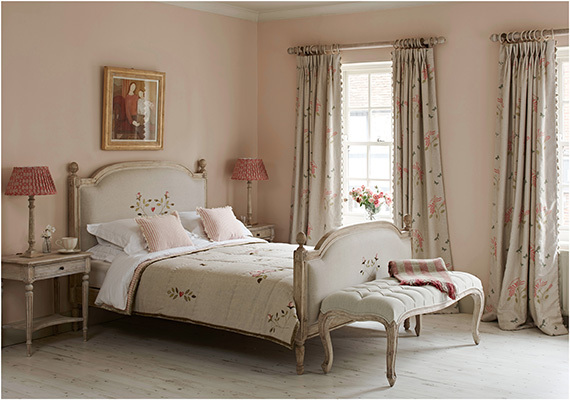 Situated in the heart of West Sussex's cathedral city, our Chichester Store is home to a wide range of our collections. You will find a selection of our key pieces including our hand-carved furniture, hand-printed fabrics, handmade cushions and hand-painted ceramics. 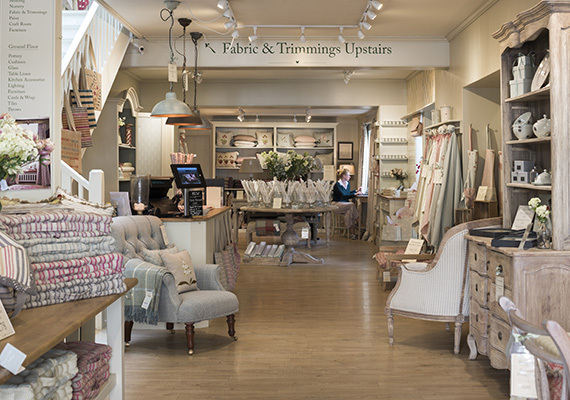 You can also meet our resident Interior Designer to discuss our made-to-measure curtain & blind service as well as our bespoke upholstered furniture. 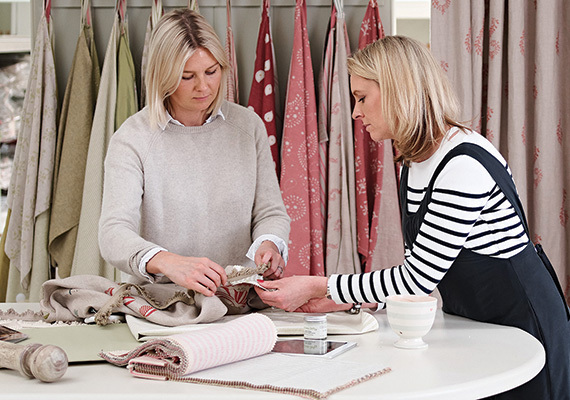 Our resident Interior Designer, Amy is here to offer advice and inspiration to create the perfect look for your home. From cushion combinations to a bespoke full interior design service, Amy is on-hand to help you design and decorate your space. To contact Amy, please call 01243 786 149 or email chichester.fabrics@susiewatsondesigns.co.uk. The historic cathedral city of Chichester is nestled at the foot of the South Downs providing the perfect backdrop to our interiors range. The shop is located in an old eighteenth century house on the sought-after North Street, only a short walk from Chichester Cathedral. 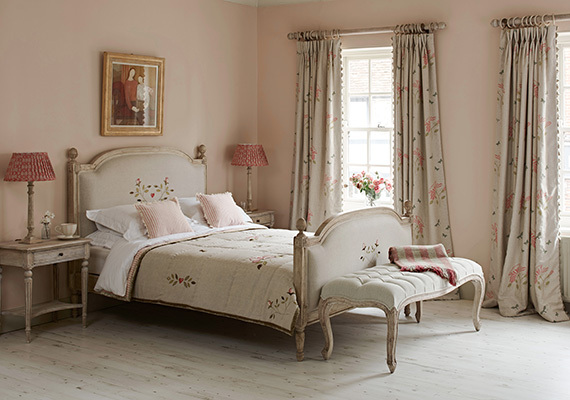 Set over two floors, our Chichester showroom is one of our largest stores and features a restful pink bedroom that you may recognise from many of our photo shoots. Parking: is available behind the store at St. Cyrians Car Park, or a 3 minute walk away at Northgate Car Park. Accessibility: Our ground floor is wheelchair accessible. Train Station: The nearest train station is Chichester (CCH), just a 10 minute walk from the store. Dogs: Well behaved dogs are more than welcome in our Chichester showroom. "I visited your shop one Saturday afternoon in the summer with my mum and you helped me pick a load of fabric for the Roman blinds for my cottage bedrooms. You were so kind and helpful … all the blinds are finally up and look stunning. The house is still very much in project mode … but I can't believe how good the fabric (which you basically helped me choose) looks! You are obviously amazing at what you do considering that you haven't even been here and just pictured it all so well and listened to what I was trying to create! I couldn't be happier and just wanted to say thank you so much!" "Absolutely love this shop. Staff are so friendly and knowledgeable. Such a treat to pop in when visiting Chichester ♥." "I visit your Chichester branch frequently. 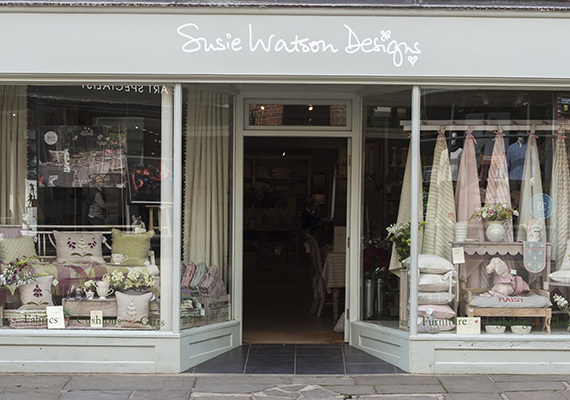 I adore Susie Watson design and have got lots of her products. Have had blinds made and have always found staff very helpful and friendly." "Your Chichester branch is beautiful and Hannah was so helpful when I visited last week. It will be easy to make my new lounge look gorgeous with your amazing products & friendly knowledgeable staff." "I found your fabulous shop in Chichester yesterday. So friendly with helpful, chatty and advisory staff. Home ideas are buzzing now!"